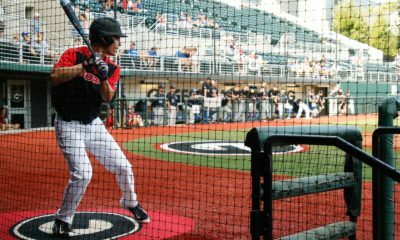 COLUMBIA, MO – Georgia clinched its second straight Southeastern Conference series Saturday with a 7-2 win over Missouri before a sun-splashed crowd of 2,328 at Taylor Stadium. Georgia (18-12-1, 5-5-1 SEC) broke open a scoreless contest in the fourth by grabbing a 4-0 lead. With one out, first baseman Daniel Nichols collected his second double of the series. After the Tigers got the second out, right fielder Sean McLaughlin drew a walk and freshman second baseman Mike Bell reached on a infield single to load the bases for freshman centerfielder Stephen Wrenn (3-for-5, 2 RBI). On a 2-1 offering, Wrenn delivered a two-run single to left field. He took second on the throw home. 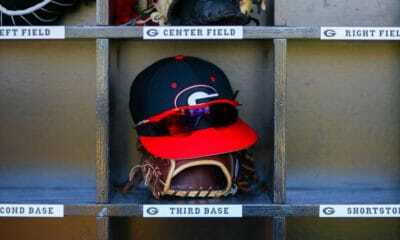 Next, junior third baseman Hunter Cole (2-for-5, 1 RBI) grounded one to shortstop Josh Lester, and his throw sailed wide of the bag, allowing two more runs to score and extend Georgia’s advantage to 4-0. Freshman right-hander Robert Tyler provided the Bulldogs with five scoreless innings, scattering four hits, three walks and registered a career-high 11 strikeouts to improve to 3-2. Junior right-hander Ross Ripple took care of the next three innings while Drew Moody and David Gonzalez preserved the win by pitching the ninth. Tiger starter John Miles allowed five runs on six hits in 5.1 innings and took the loss to fall to 2-3. With one on and one out in the sixth, the Tigers (13-16, 3-8 SEC) opted to go to the bullpen in the form of right-hander Ryan Phillips. Wrenn greeted him with a bloop single to right and Cole made it 5-0 with an RBI-single. Phillips was lifted after Cole’s base hit as the Tigers looked to Andrew Hohn. Welton added an RBI-single for a 6-0 lead. Ward reached on a bloop single to bring up Bowers. He was hit by a pitch to earn an RBI and make it 7-0. 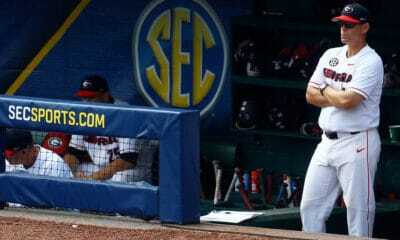 Missouri went back to the bullpen and brought in Andrew Schwaab, and he got the Tigers out of further damage. 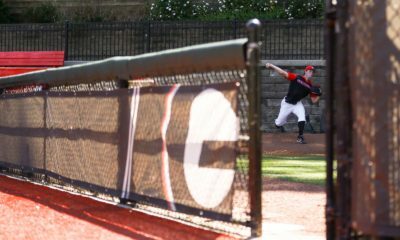 The Tigers spoiled Georgia’s shutout bid with a run in the eighth off Ripple. After retiring the first two hitters, he issued back-to-back walks and then pinch-hitter Dillon Everett smacked a 3-2 offering for an RBI-single. In the ninth, Missouri pushed another run across off Moody. With two on and two outs, Gonzalez came on to notch the final out. The series concludes Sunday with first pitch at noon EDT. Junior left-hander Jarrett Brown (1-0, 5.50 ERA) will make his first career start after 52 career relief appearances for the Bulldogs. The Tigers will counter with senior Eric Anderson (0-2, 3.44 ERA).